When we traveled to London, the first thing on our must-see attractions was Harry Potter’s Platform 9 3/4 located in King’s Cross Station. 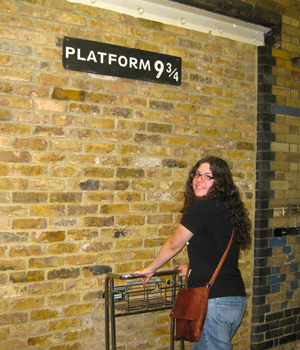 Made famous by the JK Rowling novel series, the platform is now a popular tourist spot in London, England. In the book, the magical platform is located between platforms 9 & 10, in real life it’s found next to Platform 7. Readers of the Potter books know that it can be reached only by those traveling to the Hogwarts Academy, but I firmly believe, access may also be given to true Harry Potter fans. Last we heard Platform 9 3/4 has been moved because of construction – exit the station via the East Side entrance (York Way entrance) and as you come out onto the pavement area, it should be located to your right, next to the Left Luggage area. If you still have problems finding it, not to worry. Workers at the station are asked many times a day about the location of Harry’s Platform. When I asked for directions I only had to start my question “Could you tell me where H…” The conductor put up his hand, smiled and gave us precise instructions. We found it, and spent the rest of our time in KIng’s Cross preparing for our journey to Hogwarts. Silly it may be, but we were enchanted! Enjoy. Haha! I love the photo! i have a similar one 🙂 Favorite Harry Potter landmark. Great blog, best wishes from the Hall-Wattens Region in Austria!